I've been doing a lot of research on the Impressionists and the climate in Paris surrounding the Impressionist movement. I'm focusing on the coming exhibit for my final web design project in the HTML class I'm taking this summer. 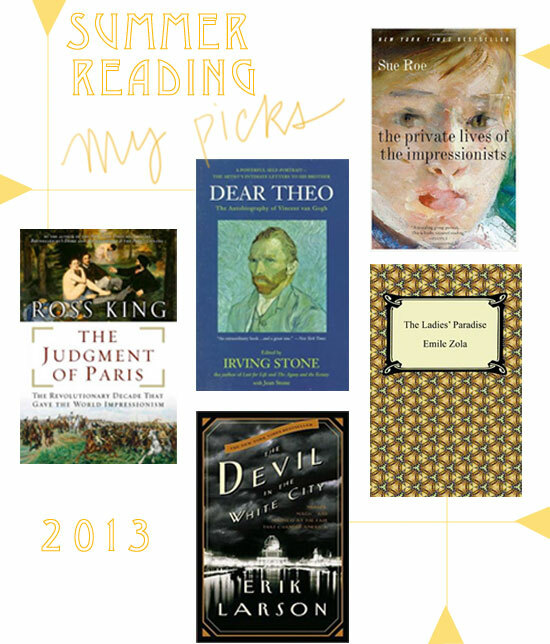 Here are the books I'm currently reading, mostly art/impressionist related. I'd recommend all of them. The Judgement of Paris, The Revolutionary Decade that Gave the World Impressionism I'm actually listening to this book on CD when I drive into the city for class. It is about the birth of Impressionism and the drama that surrounded it. No artistic movement has ever been so controversial. It was actually coming to life at the same time the U.S. was engaged in the Civil War. It has been fascinating to understand more of the history behind the movement. I'm only 4 chapters in, so I'm excited to see it unfold. Dear Theo, The Autobiography of Vincent Van Gogh Van Gogh is one of my dear favorites. His story/life was so tumultuous and I feel that you cannot understand and appreciate his work without a knowledge of the man himself. He was so full of passion and his brother Theo was the reason he survived as long as he did. His brother not only supported him financially, but he was the pillar of Vincent's emotional support. Their relationship was incredible and this book reveals the depth of love, support, inspiration, and encouragement Theo gave Vincent, all revealed in letters that they wrote to one another. The Devil in the White City I am most excited about this book. Grant and I are reading it out loud at night and it is the PERFECT mix of art/mystery/history. It's been out forever and on best seller's lists, so I'm surprised I haven't read it yet. It "intertwines the true tale of the 1893 World's Fair and the cunning serial killer who used the fair to lure his victims to their death".2 Sounds gory, but it has been so interesting thus far. We're only a few chapters in! I love learning about the architecture and history that surrounds Chicago. The Ladies' Paradise by Émile Zola I just discovered a little while ago that the Art Institute has a book club called, Reading between the Lions. When exhibitions come to the Institute the book club features a book that relates to the exhibit. There's discussion questions they post online and members can attend a discussion on the book at the museum. For Impressionism, Fashion & Modernity, we're reading this book by Émile Zola. It is about the rise of the modern department store set in late 19th century Paris. The story plays out through the eyes of one of the department store employees, Denise. We see relationship drama unfold alongside the building of modern commercialism/shopping! It's an easy read and I love getting the perspective of Paris at this time through the eyes of this young girl. 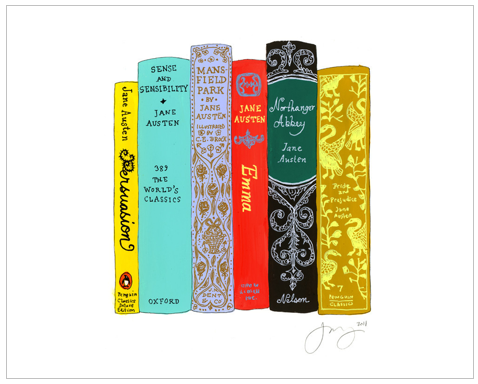 I may post some other summer reading posts--maybe what my husband & sisters are reading. I always think it's so interesting to see what people choose to read. 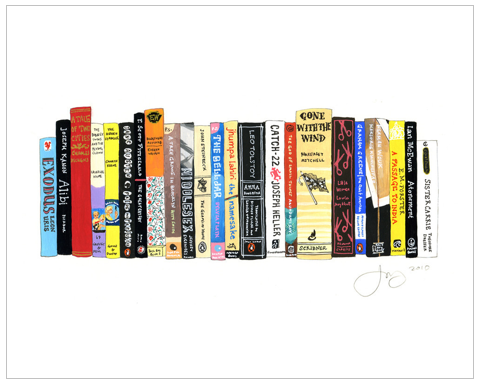 Have you heard of Ideal Bookshelf? I will end up ordering a painting or print at some point in my life. They are too good to pass up. Perhaps, I'll have to try my hand at painting my own. I got Grant this book last year for Christmas. It's a really cool idea. Are you reading any books this summer?